The following editorial was submitted by Mr. Nicholas Karakas, a long-time Greek Orthodox Church activist and philanthropist from St. Louis, Missouri who resides in Naples, Florida. The opinions expressed may not necessarily belong to The Pappas Post. Then followed accolades, applause and gay feelings of divine exaltation. The Archdiocesan Council report does not indicate any substantive requests or questions asked regarding the reports as presented. It seems like the people who were in charge while these shortages were occurring are indeed investigating themselves. So much for an independent audit! So, what happened to the grandiose and auspicious announcements that the Archdiocese and the Church had adopted the system of openness and responsibility? ZERO. The Archdiocesan Council produced no hard copy documents of the financial status of the Archdiocese and the St. Nicholas Shrine Fund. Works are words and can be designed to artfully disguise the real situation. Where is the transparency once promised? The aura of being solicited to serve on the Archdiocesan Council is such that few objections are raised and if so that person(s) lasts to the end of his/her term or just resigns. In a list of errors committed by Archbishop Demetrios is the reinstatement of Archimandrite Makras to Holy Cross Seminary. This person has been accused of inappropriate relations with two women. This reappointment comes after Bishop Andonis stated that “Father Makras will not return to the institution.” Tell me dear readers, is the Greek Orthodox faith so bereft of qualified teaching professors that no one can fill the Father Makras position? How sad. This is a grave error and must be corrected. So much for church discipline in these matters. My mind wanders to about 25 years ago, when a bishop sexually assaulted a young woman. The religious court met and interviewed the bishop involved for almost an entire day. When the time came to adjourn the panel, the victim and her attorney were dismissed out of hand without being interviewed, spoken to or offered solace, as her father was an elder priest and deeply concerned of his church pension. You are correct, the matter was dropped. The young female victim will carry the terrible memory of the assaults which will affect her throughout her life. The accused bishop was finally re-assigned, believe it or not, to a youth camp. YES! As in the Catholic Church, all priests and bishops (including ours) protect one another. I ask you what kind of message do these sexual assaults send to our Orthodox young men and women, to our nation, to the world? Has comfort and security become the password of Greek American society? Has political correctness precluded us, the “omogenia,” from demanding openness, transparency and responsibility from our Archdiocese? Many of us have already tried beseeching, imploring and begging to no avail. Does the inaction of the diocese bishops, their councils and the Archdiocesan Council implicate a certain personal struggle or maybe cowardice to confront our Orthodox Church when it falters? 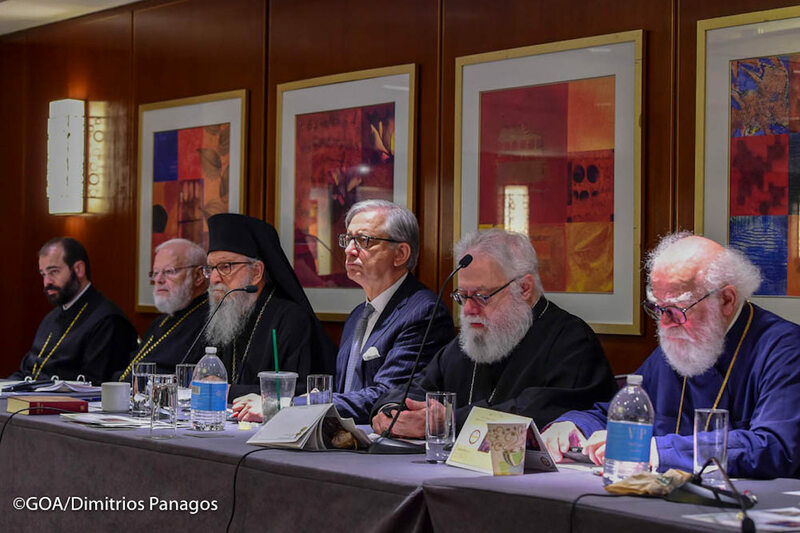 Doesn’t it appear peculiar that no bishops will stand up or out with Patriarch Bartholomew in his second request that Archbishop Demetrios resign. It’s a case of forget about Church discipline, its rules, clergy obedience and tradition, it seems as if our faith is governed by two sets of rules, one for the clergy and one for the faithful who support their financial wellbeing. Our bishops and clergy need to be mindful that many of our spiritual and faithful have found satisfaction and contentment in other Orthodox jurisdictions where English is almost 100%. It seems that our bishops do not relish the truth of transparency and fiscal responsibility and choose to be silent. This wonderful reader if, you are still with me, is the Church as I see it, and each one of us works to make it into God’s Grace. If I have offended anyone, God please forgive me. Karakas has been an active member of numerous advisory boards at the university and received the chancellor’s medallion for his leadership and dedication to principles of higher education. Karakas is also a recipient of the Greek Government of the Order of the Phoenix, the highest civilian medal offered by that government. The St. Louis native was chair of his family’s business, Marcus Distributors, which distributed candy, tobacco and grocery products. He served as president and board member of the Missouri Association and the National Association of Tobacco Distributors. He has also served on numerous boards of community organizations, including the Mathews-Dickey Boys’ & Girls’ Club of St. Louis.